I often crave biscuits and gravy for breakfast, but I’m no baker and usually don’t have the time (or inclination) to whip up a batch of biscuits from scratch. By substituting English muffins for biscuits and slapping a soft-cooked egg on top (just because I can) I turned this into a no-muss, no-fuss breakfast that I can make whenever the mood strikes. Brown the sausage in a large skillet over medium-high heat. Do not drain. Add the baking mix and cook over low heat for 5 minutes until it starts to form a roux and begins to brown. Remove pan from heat and stir in the milk a little at a time. Scrape the bottom to get up any brown bits. Return to medium-high heat and stir occasionally until gravy comes to a simmer and starts to thicken, about 10 minutes. Add the hot sauce, salt, and black pepper and stir to combine. Reduce heat to low. In a non-stick fry pan, fry the eggs over medium heat until the whites start to set. Cover the pan with a lid and let cook for another minute or so until the yolks have just started to set. Gooey, yolky, hot saucy – yummmmmmm! Ladle gravy over warm muffins and top with the eggs. Splash with additional hot sauce as needed. 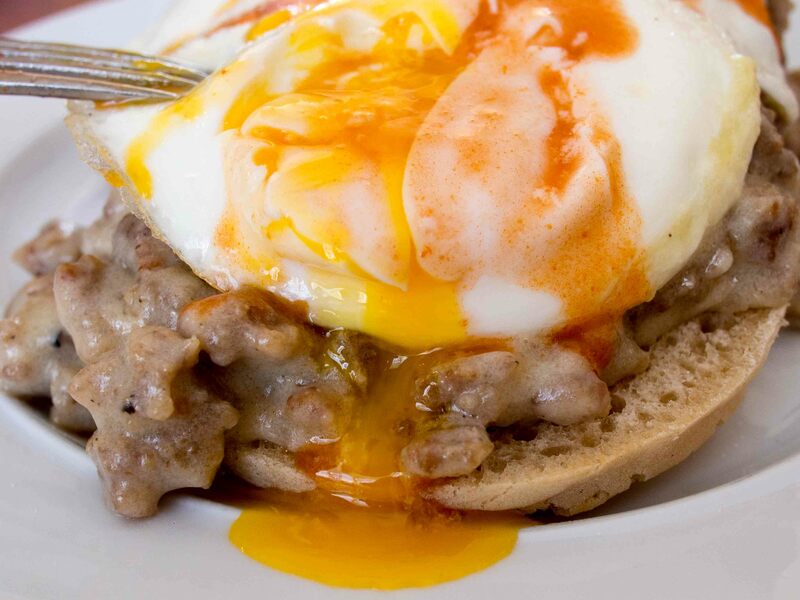 The English muffins aren’t quite as decadent as biscuits, but the soft egg makes up for it. The big plus is that I can have this on the table in under 20 minutes. Looking for something hearty, but not overwhelming, for Monday morning to soak up all the Super Bowl fun? In a small bowl, whisk together the yogurt, pancake mix, baking soda, and eggs until just combined. In a medium non-stick fry pan, melt a pat of butter over medium heat. Drop 1/4 – 1/2 cup servings of pancake batter into pan. Cook on the first side until bubbles start to form on the surface and edges are starting to brown. Flip and cook the other side for about a minute. These are definitely different from any other pancakes I’ve made. It’s kind of hard to explain – airy and tender, but also rich and filling. Let’s just call them “lightly decadent” and leave it at that. My first experience making oyster stew was not a pretty one. I remember trying to follow some snooty recipe by scalding milk in a paper-thin tin pan over a temperamental electric burner while a certain persnickety relative told me how I was doing it wrong. It came out fine, but no fun was had that evening. Scalding milk is a waste of time. Recipes are good starting places but nothing is written in stone. Feel free to experiment. Cook with people or for people but don’t let anyone tell you how to cook. Just like there is only one captain on a ship, there is only one chef in the kitchen. Melt the butter in a large saucepan over medium heat. Add the leek and sweat until translucent, about 5 minutes. Add the clam juice and bring to a boil. Reduce heat to a simmer and cook until the juice has reduced by half, about 10 minutes. Add the cream, milk, celery salt, Bay seasoning, hot sauce, and lemon juice and bring to a simmer. Taste and adjust seasonings. Add the oysters and parsley and simmer until the oysters start to curl, about 3 minutes. I don’t know why I don’t make this more often. 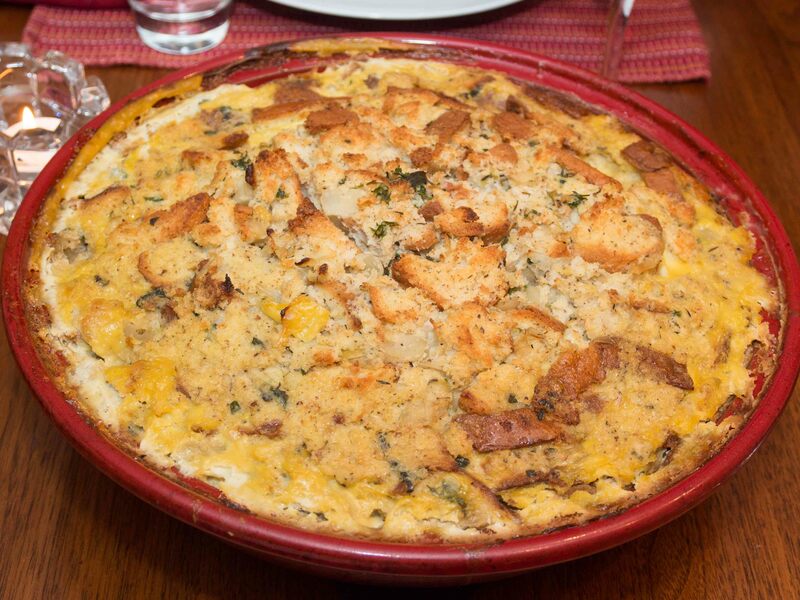 It’s rich, elegant, tasty, and comes together in a flash. I’ve tried a lot of different aromatics in this dish and I really like the way leeks bring a sweet and subtle flavor to the dish without overwhelming the oysters. 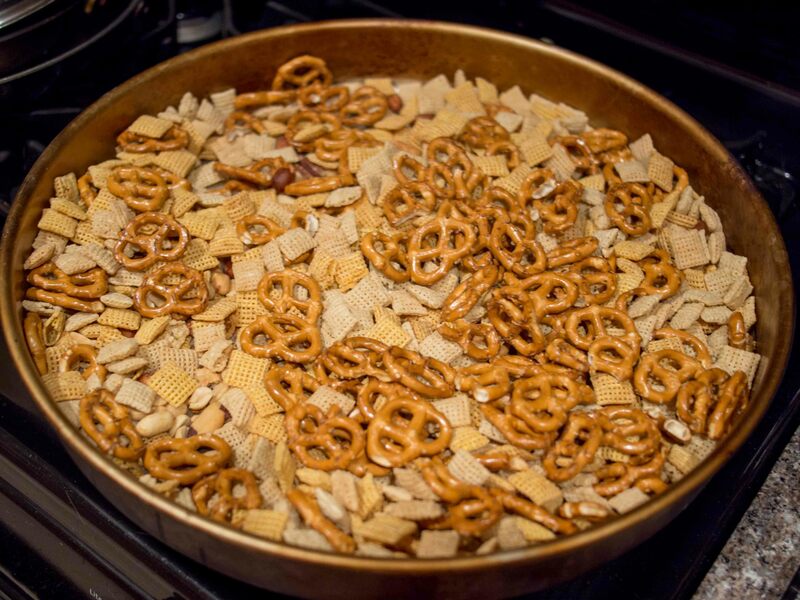 Chex mix one of my favorite holiday snacks. Thanks to the hot sauce and fresh garlic, this recipe tastes a ton better than the commercial ones and it’s gluten-free. 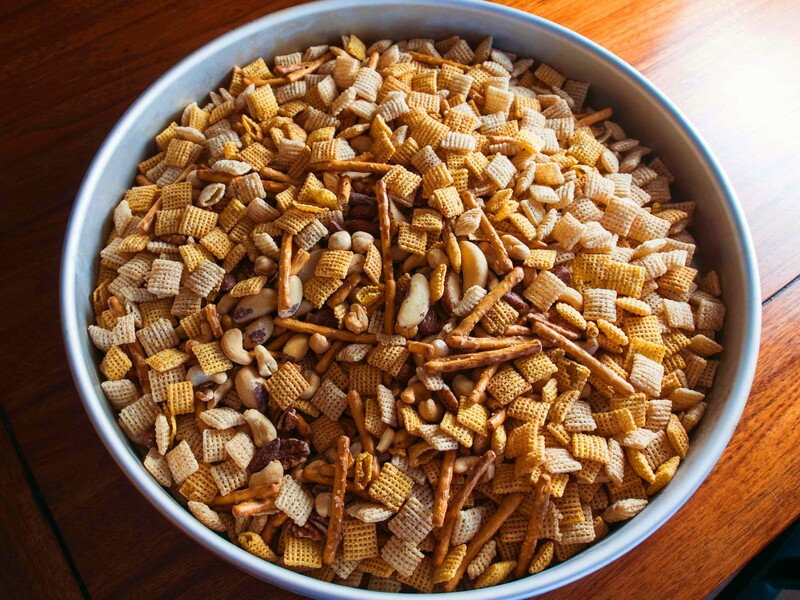 Pour cereal, pretzels, and nuts into a into a large mixing bowl or cake pan. 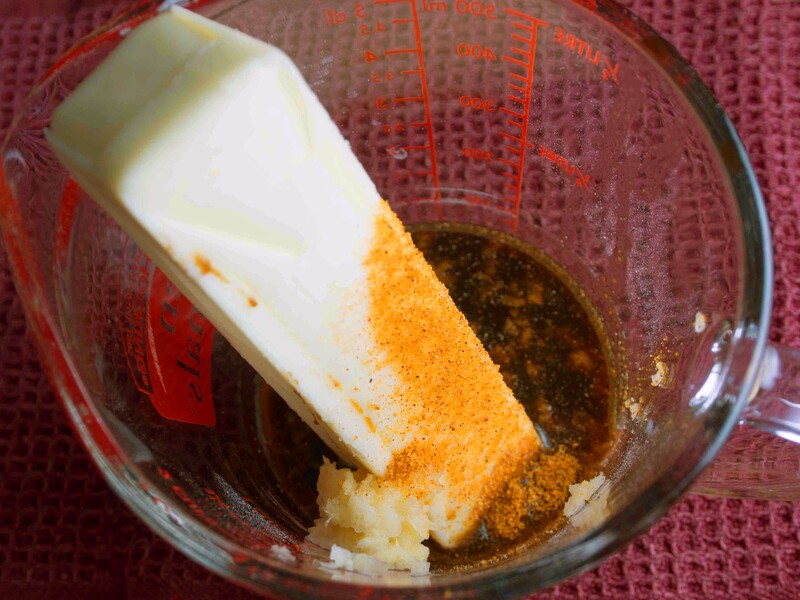 In a microwave-safe bowl, add butter, Worcestershire sauce, garlic, season salt, and onion powder and microwave until butter is melted. Stir together and taste. Add hot sauce and adjust seasonings as you see fit (I added a more Worcestershire and hot sauce). Slowly pour butter sauce over cereal mixture, tossing and stirring as you go. Transfer mix onto one or two baking sheets (I left mine in the large cake pan that I mixed everything in) and bake, checking and stirring every 15 minutes until mix is toasted and fragrant, about 1 hour. Remove from oven. Taste, and if you want to, grind just a bit of sea salt over it. Let cool and store in an air-tight container. I’m VERY happy with how this batch turned out – salty and savory with just the right kick of heat. I used less cereal and more pretzels this time and I think it makes for a crunchier mix. As fast as this disappears, I’d double the recipe for a crowd. Tuna is the perfect fish for grilling – firm and lean with a meaty flavor that goes with just about anything. Here I’ve bumped up the taste a little bit with an herby marinade. 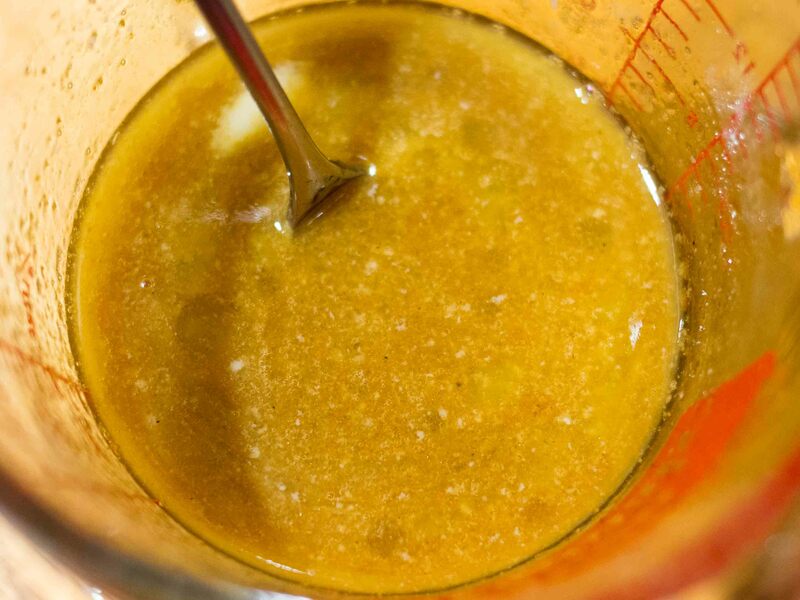 Make the marinade by combining the lemon juice, honey, peppers, salt, garlic, herbs, and olive oil in a food processor and giving it a whirl until everything is well-blended and has started to thicken, kind of like a thin mayonnaise. Put the tuna in a lidded container, cover with the marinade, and turn to coat. Stash in the fridge while you get the grill set up. Set your grill up for a direct cook over high (600°F) heat. I treat tuna steaks like beef steaks – grill them hot and fast to just medium-rare. 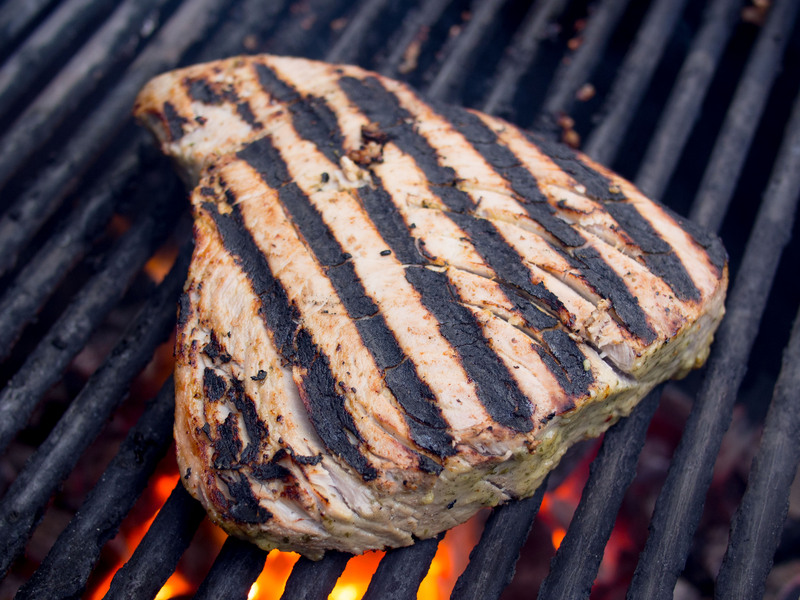 Grill the tuna steak for about a minute per side, checking for doneness often. The tuna should yield gently when you press on it with the tongs. Not too firm, or you’re headed toward cat food territory. 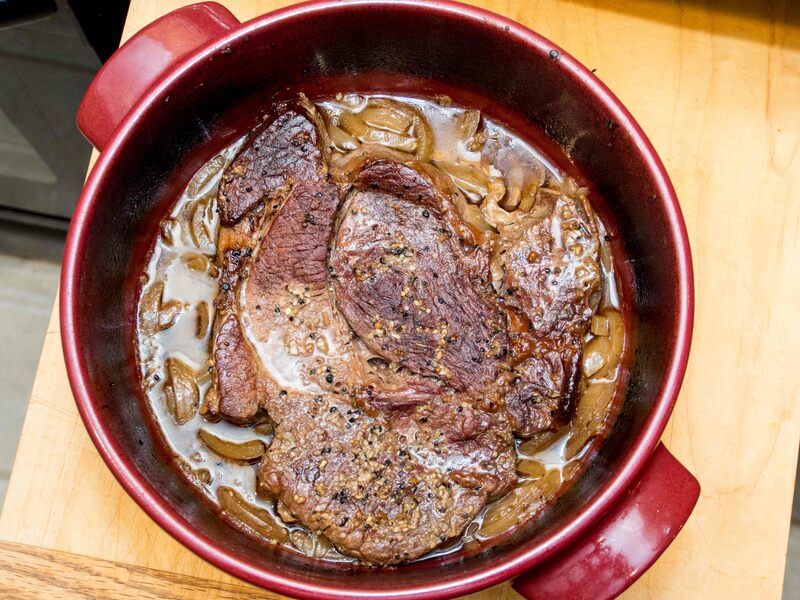 It’s best to pull the steak off the heat just before it’s done and let the carry-over heat finish cooking it. Let rest for 5 to 10 minutes before serving. Tuna is a nice change of pace from steaks and chops and a great fresh and light taste for summer. The holidays are over, but this classic party snack is perfect for any get-together. I’ve re-vamped it a bit to make it gluten-free using The Pioneer Woman’s recipe as a tasty starting point. In a microwave-safe bowl, add butter, Worcestershire sauce, garlic, season salt, and onion powder and microwave until butter is melted. Stir together and taste. Add hot sauce and adjust seasonings as you see fit (I added a bit more seasoned salt and onion powder and went pretty heavy on the hot sauce). Transfer mix onto one or two baking sheets (I left ours in the large cake pan that I mixed it in) and bake, checking and stirring every 15 minutes until mix is toasted and fragrant, about 1 hour. Chex mix one of my favorite snacks and I’ve really missed it since going gluten-free. This recipe knocks it out of the park compared to the commercial versions. The fresh garlic makes a huge difference, as does the hot sauce. I can see making up a big batch of this for the Super Bowl. 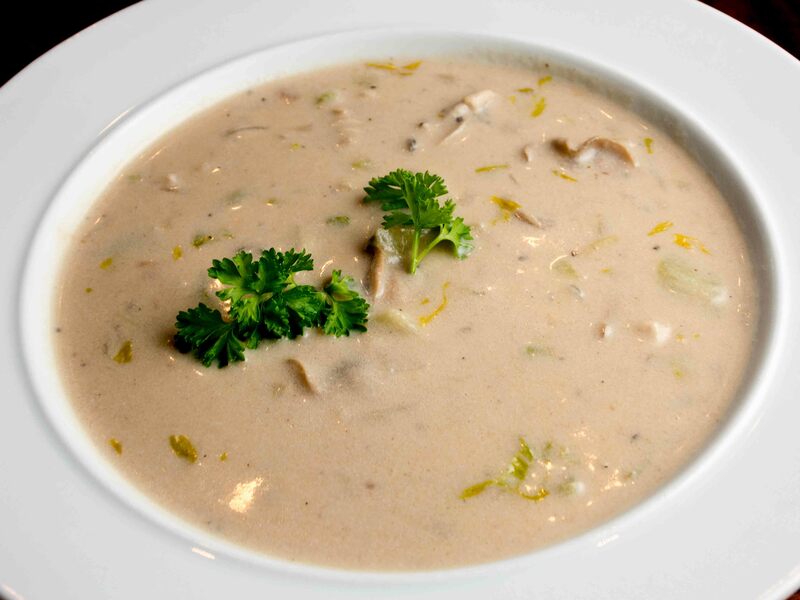 It wouldn’t be the holidays without oyster stew. When I was a kid this was always a thin soup that had more oyster crackers in it than actual oysters. These days I like to make it as thick and creamy as possible. Melt the butter in a medium saucepan over medium-ish heat. Add the celery and onion and sweat the veggies until they start to soften, about 5 minutes. Reduce the heat and stir in the flour to make a roux. Cook the mixture, stirring often, until the roux just starts to darken, about 5 minutes. Slowly add the milk and cream, stirring constantly. Add the celery salt, Chesapeake Bay seasoning, hot sauce, and lemon juice. Taste and adjust seasonings, adding salt and pepper as needed. Bring the soup almost to a simmer. Almost being the key word, as bringing the soup to a boil will cause the cream to separate. Cook over very low heat for 15 minutes until the soup is thick and creamy and the veggies are very soft. Add the oysters and their liquor and cook for another 3-5 minutes until the edges of the oysters start to curl. Garnish with fresh parsley and serve with more hot sauce on the side and some crusty bread for dipping. This turned out downright decadent. 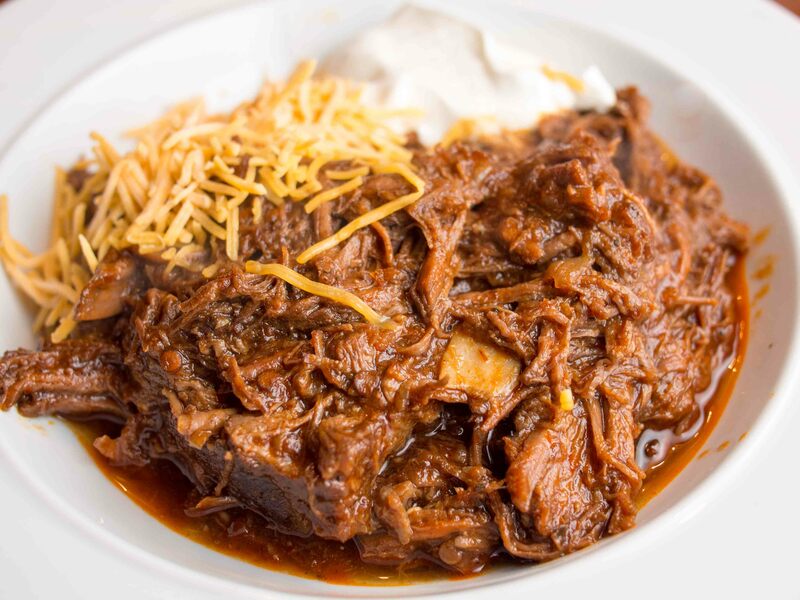 The roux is so simple, but makes a lot of difference in how creamy and rich the stew is. 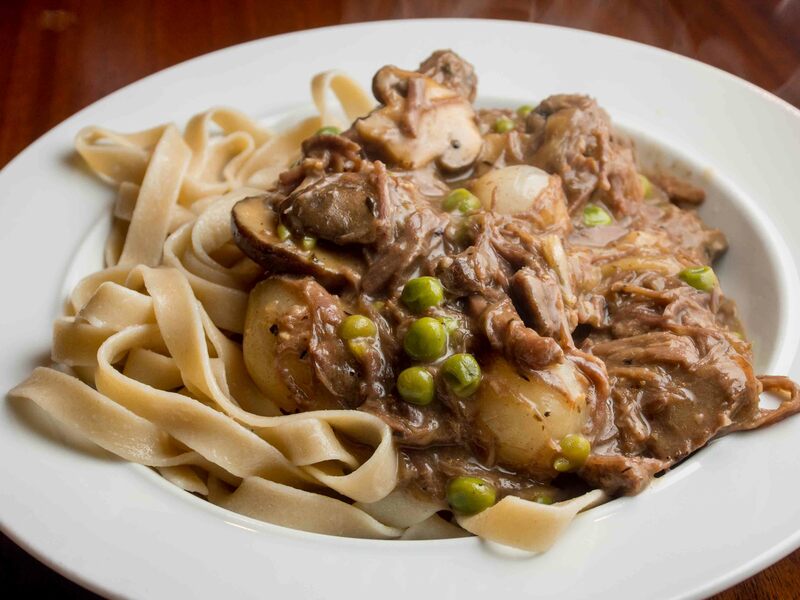 This classic braised beef dish, featuring hearty gluten-free tagliatelle pasta from the fine folks at Jovial Foods, is the perfect cure for the arctic temperatures we’ve been having lately. Pat roast dry and sprinkle with a good coating of steak seasoning. 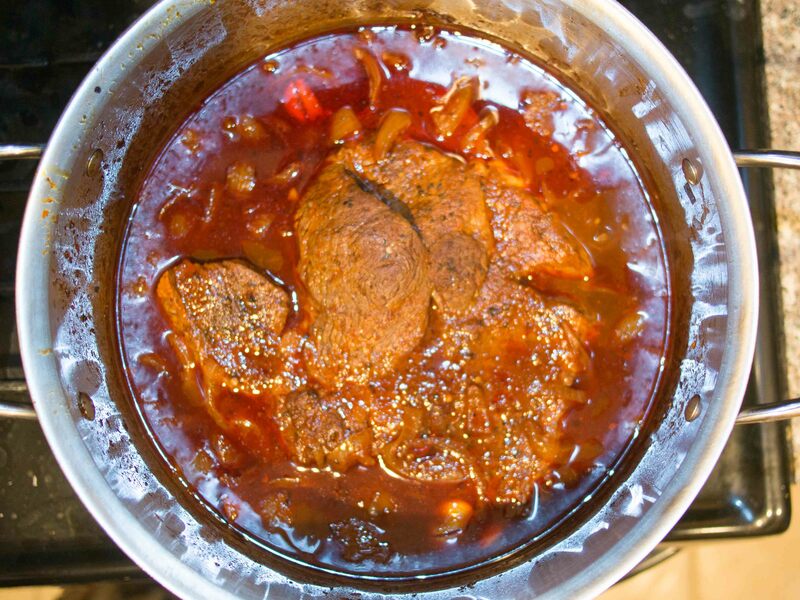 On the stove top, heat the oil in a large Dutch oven over medium-high heat until it starts to ripple. Sear the roast for 3 to 4 minutes per side (mine was fairly flat, so it only had two sides) until it has a nice brown crust on it. Remove the meat to a plate. Reduce the heat and add the onions. Cook until they just start to soften, about 5 minutes. Add the garlic and mushrooms. Cook until the mushrooms start to give off their moisture, about another 5 minutes. Increase the heat a little and deglaze the pan with the red wine, scraping the bottom to get up all the tasty browned bits. 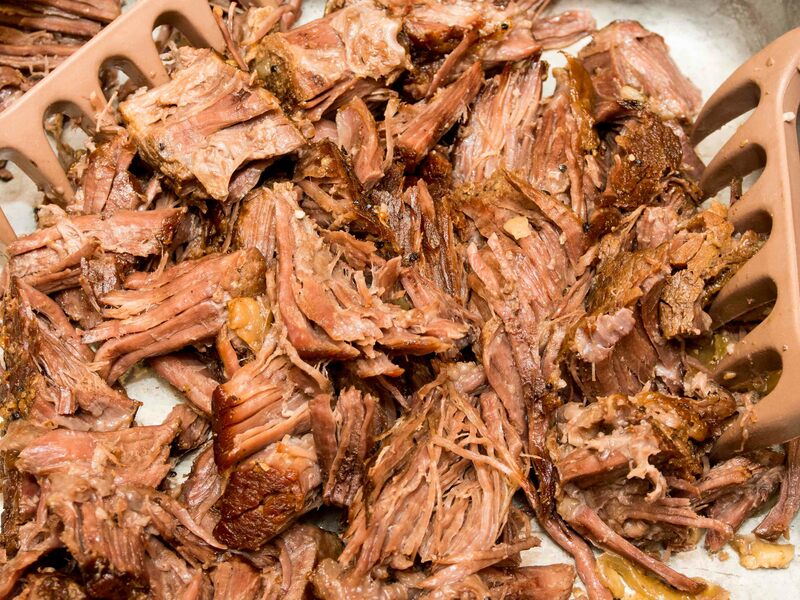 Turn off the heat and return the roast and any accumulated juices back to the dutch oven. Add the Worcestershire sauce and enough beef stock to cover the mushrooms and come about a quarter of the way up the site of the roast. Put the lid on and move to the whole works to the oven. Move the Dutch oven to the stove top and bring the mushrooms and stock to a boil. Add the peas and onions, then reduce the heat to a simmer and cook until the onions are tender – about 5 minutes. Stir in the meat and the cream. Taste and adjust seasoning. Put the cornstarch in a small bowl and slowly add the milk, stirring constantly until you get a smooth slurry. Stir this into the stew and cook until it starts to thicken – about 5 minutes. Let the stew simmer while you cook the pasta according to the directions on the box until it is al dente (about 2 minutes less than the recommended time). Drain and toss with the butter. Serve the stew over the noodles. This is one rich and tasty stew. 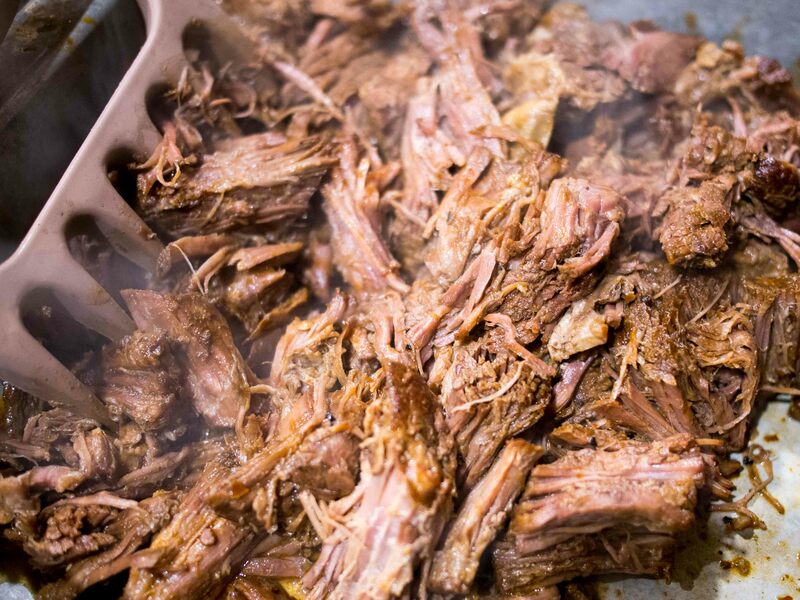 Browning and braising the meat in the same pot and building the stew up from the braising liquid gives this dish a complex, beefy flavor. Again, the Jovial noodles held up much better than another gluten-free noodles I’ve tried. They didn’t even fall apart when I reheated the leftovers. I’m impressed. 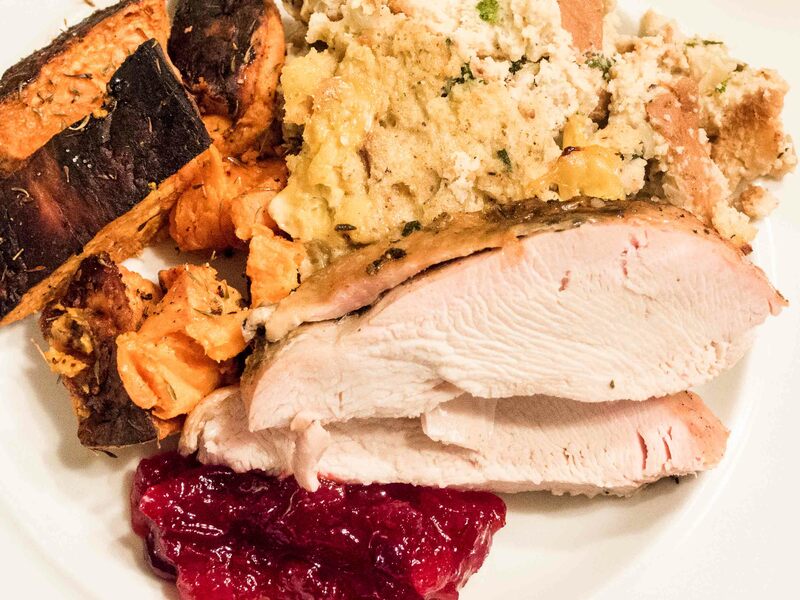 We will be traveling to see family for Thanksgiving this year, but decided to put together a few of our favorite T-day recipes a week early and share them with some good friends. The bird was made with what is becoming my standard turkey recipe on the Big Green Egg. 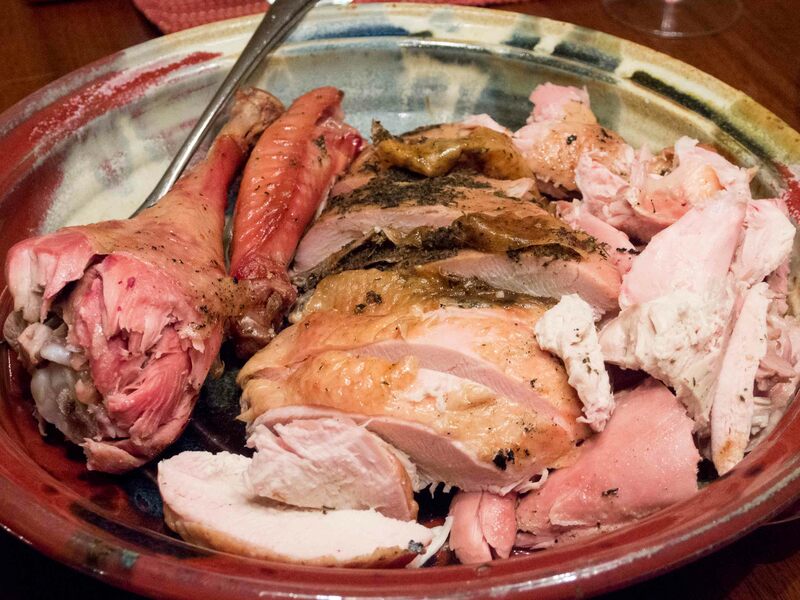 A new recipe for this year was Michael Ruhlman’s custardy Thanksgiving Dressing. In a large sauté pan over medium heat, melt the butter and then sweat the onions until they begin to soften (about 5 minutes). Add the sage and thyme and season with a tablespoon of sea or kosher salt and some freshly ground black pepper. Reduce the heat a bit and continue cooking until the onions have just about melted themselves into the butter, but have not started to brown (about another 5 minutes). Remove from heat and let cool. Whisk the eggs together in a medium bowl. Add the turkey stock and whisk to combine. In the biggest bowl you can find, combine the onion mixture, bread, custard (eggs and stock mixture), and parsley. Toss everything to coat, then set aside while the bread soaks up the custard. Stir and press the bread down into the liquid every 10 minutes or so until all of it is wet. Butter a 6-quart baking dish (this recipe expands as it cooks, so use a bigger dish than you think you need) and pour in the stuffing. Dot the top of the stuffing with extra butter. Cover and bake until the mixture has set (45 to 60 minutes), then uncover and bake until golden and crispy on top (another 15 to 30 more minutes). Continuing with the butterscotch kick I’ve been on, dessert was Nancy Silverton’s Butterscotch Budino topped with David Lebovitz’s Best Chocolate Sauce. In a large bowl, combine the cream and milk and set aside. In a large, heavy pot, combine the sugar, water, and salt. Bring to a boil over medium-high heat, whisking often to prevent burning. Cook until the sugar has caramelized to deep, dark brown and starts to smells nutty. Reduce the heat slightly and continue whisking for a teensy bit longer until you get that first bitter whiff of the sugar starting to burn. Remove from the heat immediately and slowly whisk in the cream mixture. Be careful – as it will steam and spit and the sugar will seize. Return to the heat and continue whisking until the sugar melts and caramel is fully combined. Increase the heat and bring to a boil while stirring frequently. Remove from the heat. In a small bowl, whisk together the egg, egg yolks, and cornstarch. 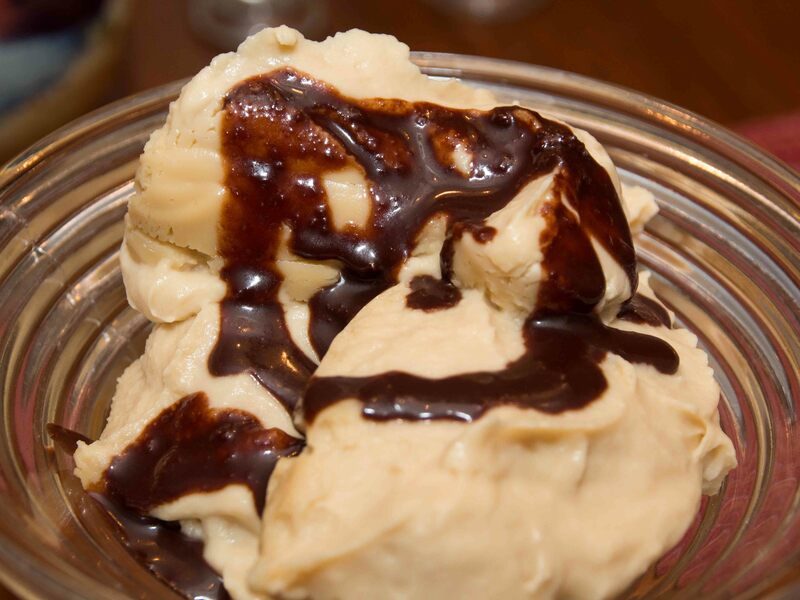 Temper the egg mixture by slowing adding about half of the caramel cream, 1/2 cup at a time, while whisking constantly. When the egg mixture is warm, pour it back into the caramel cream and cook over medium heat, whisking constantly, until a very thick custard forms (about 2 to 3 minutes). Remove the custard from the heat and whisk in the butter and rum, stirring until the butter has completely melted. Pour the custard into your serving dish, cover, and refrigerate for at least 2 hours. In a small saucepan over medium heat, whisk together the water, sugar, corn syrup, and cocoa powder. When all of the sugar has dissolved and it just begins to boil, remove from heat and stir in the chocolate chips until melted. Pour into a covered container and stash in the refrigerator until just before you are ready to use it. Rewarm before serving. Between these recipes and the dishes our friends brought, it was a very fine meal, a lovely evening, and we have much to be thankful for. I see all of these recipes making repeat appearances on our table. This is the second year for this turkey recipe, and it is definitely a keeper – moist, tender, and tasty. The dressing was just plain outstanding. I never would have thought of dressing as just a savory custard, but it tasted great – very rich and dense, but not at all gummy like some dressings can get. Next time, I would combine the stock with the onion/herb mixture, let them simmer together for a bit to infuse the flavors, then taste and adjust seasonings before mixing everything together. Also, adding a bit of sausage wouldn’t hurt either. The budino was amazingly rich and thick. It was almost more of a ganache than a pudding or custard. And the chocolate sauce was the perfect foil for it – the semi-sweetness playing well with the burnt sugar to keep it from being too sweet. Definitely a dish to serve with coffee. Have a happy and safe Thanksgiving, everyone!